Gift Vouchers make the perfect gift for friends and family. All you have to do is give us the details and we will send the gift vouchers, on your behalf. You can redeem the Crossword Gift Vouchers in part, at a time. That means that you do not have to redeem the entire Gift Voucher value at one go, and can use it over several visits. The Gift Vouchers are redeemable at any of the Crossword stores (excluding franchisee stores) across the country. The period of validity of the Gift Voucher is one year from the date of issue. Crossword Bookstore Gift vouchers to be valid only at the following locations. Valid only at all outlets of Crossword in India for 12 months from the date of issue. 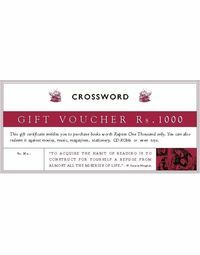 Only original & valid gift vouchers at the sole discretion of Crossword shall be accepted for redemption. No duplicate gift vouchers shall be reissued if lost, misplaced or stolen. Gift vouchers can be partly redeemed, only a credit note for the remaining value will be issued by the store. The credit note is valid for 6 months from the date of issue and can be used for purchases at any crossword store in India. For corporate gifting inquiries please call our Customer Care @ 1800 3000 1203 from 9:30 am to 7:00 pm Monday to Friday, or email us at estore@crossword.in.